Today’s post is a guest post from the well known tournament player Orange Devil. 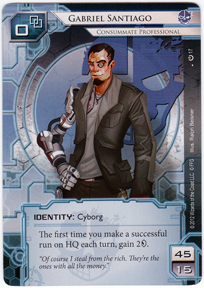 Orange Devil got 2nd place in both OCTGN tournaments, and has contributed to the development of Netrunner strategy. My aim with these articles is to do a play by play high level analysis of the finals of the Nordic Championship. What this means is that I will go over each play made in these games and comment on them from the perspective of someone who doesn’t know the exact decks, and in this case, hands, of the players but instead relies on general game knowledge and the information public at the table. This is useful because it allows us to look at what both players should be thinking about their opponent’s capabilities at any time. I go into much more detail than I believe anyone has ever done before and as a result may at times come off as rather harsh. 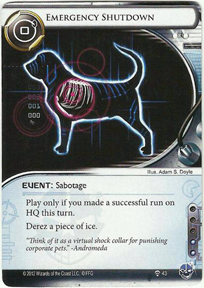 Please understand that nothing here is intended as personal criticism of the players but instead as an in-depth look at the game of Netrunner from a stress- and time-constrained free environment. 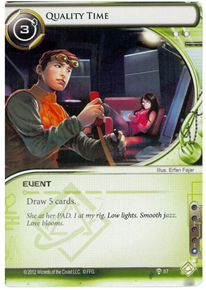 While the intention is to focus on insights that may even teach veteran players a thing or two, I will not gloss over elementary aspects of Netrunner, and as such hope that all players of any skill level can take something from this article. Should this turn into a series, then it will be intended to be read as a series and I will start glossing over details that I have extensively discussed in earlier articles. Lastly, I have selected this game because it was available for easy viewing online, looked interesting and was a finals of a relatively major tournament, thus hopefully raising the skill level and making it more fair to criticize players for even small mistakes. While I will try to be descriptive, I recommend watching the game alongside this analysis. We get a game of Gabriel Santiago versus Core Weyland. This immediately tells the corp that he needs to expect unrelenting aggression right out of the gate, especially focused on HQ and Archives through Sneakdoor. Common splashes include Anarch breakers, Parasite, some form of R&D pressure, usually either Maker’s Eye or Indexing with outside chances of R&D Interface and Medium and back in the day many decks ran a single Magnum Opus to prevent running out of steam. Other big threats include Account Siphon, Faerie and Emergency Shutdown. Additionally, many Gabriel decks go into tag-me mode at some point during the game, which we must be aware of. The weakness of Gabriel is a propensity to run out of steam if the corp slowly ices up centrals and then builds a big remote, making runs unprofitable and expensive. If Gabriel does not already have a commanding lead at this point, he is in a very bad position. Weyland Core telegraphs big operation economy and Scorched Earth. Scorched can either be a primary or secondary win condition, depending on the focus of the deck. It is vital to find out what kind of deck we’re up against as soon as possible. 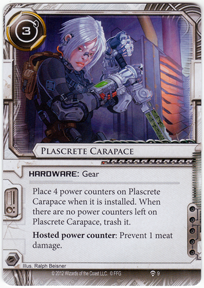 Alternatively, Weyland can run without Scorched altogether, using the mere threat of it to force us to play safe and install Plascrete. Weyland can go all in on trying to flatline us, running cards like Posted Bounty, Dedicated Response Team, Snare, False Lead, SEA Source, Bernice May and Project Junebug. 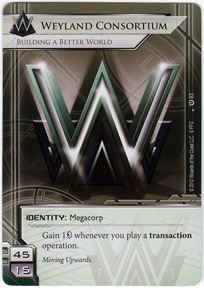 Alternatively, Weyland can use its big economy to build up a good sized remote with big ice and muscle through agendas. Tollbooth, Ash and Corporate Troubleshooter are cards that point in that direction. Weyland can also leverage its strong economy into using Sansan, Trick of Light or (rarely) Biotic Labour to fast advance. 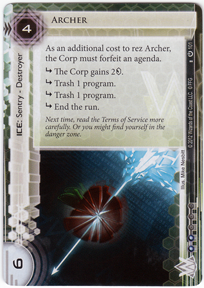 Lastly, Weyland can try to rush using program destruction ice, Oversight AI and not caring about Bad Publicity to buy itself the time it needs to close out the game. In any case, unless the runner has an economic advantage, he should never run on unknown ice (or upgrades) on his last click and in general be very wary of doing so at all times due to Snare. Both players mulligan, runner consideres a mulligan for a while after corp takes his. Generally this means the corp didn’t get a hand that could protect him from Gabriel’s early aggression, and while Gabriel may have had a playable hand, decided to try for a better one. Had Gabriel kept his hand this should cause some worry to the corp as it makes it likely he has the tools he needs to put on serious early pressure and thus probably requires even more careful play. Ice on HQ and R&D followed by taking a credit. 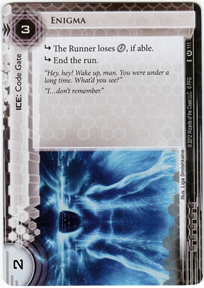 This is the most standard opening in Netrunner and unless you have a good and specific reason to do something else or you got a hand not capable of doing this opening, you should always do this. Against Criminals it can be dangerous to put two pieces of ice down if you can’t rez both due to Forged Activation Orders. Additionally, against Gabriel you may consider icing Archives instead of R&D first turn, although this does telegraph an agenda. However, either protecting that agenda or keeping Gabriel away from his build in economic ability can be worth the trade-off of showing a card or two on R&D. On the other hand, Indexing and Maker’s Eye can really punish this. If you get a hand including a Caduceus, an Ice Wall and another 3 or less cost ice (or you feel ok bluffing that you did), you can also ice all 3 centrals on the first turn, although your vulnerability to FAO goes up considerably in this opening. The corp has also telegraphed to the runner here that he does not have a Hedge Fund. The runner runs R&D on the first click, sees a Caduceus and lets the first trace succeed. In my view this is a clear mistake, but there is a lot going on here, so let’s take it one step at a time. Firstly, a first click run means no Sure Gamble in hand and likely no Easy Mark either. Gabriel has 3 general lines of play on his first turn: 1. Run HQ first 2. Run R&D first or 3. Play Sneakdoor and run HQ three times. Sneakdoor and HQ 3 times puts him at 3 credits in the bank and likely at least 2 cards from HQ known. It also puts a threat on the board for the next turn that the corp pretty much needs to answer right away, although it does not do anything to the corp’s economy. However, if the corp then ices Archives turn 2 we can safely Sneakdoor again turn 2 and not care if we lose our Sneakdoor to a Rototurret, or even better, a Grim. No matter what the ice, the corp has spend money and time defending a server we now no longer care much about, and is thus generally more vulnerable when we now follow up and attack HQ and R&D. The exception here is Caduceus on Archives, which is a real headache. Sneakdoor into hand three times can still be strong turn 2, which means that not doing this play telegraphs little. Running HQ first basically forces a rez and gives us the rest of our turn to respond to the ice we’ve seen. If we have the kind of hand that allows us to really punish being able to get into HQ and likely to let us in (a breaker and/or a Special Order, Account Siphon, Shutdown) this is probably the preferred order. Alternatively, if we have a way to pressure R&D (Indexing or Maker’s Eye, ideally combined with a Forged Activation Orders to rule out Ice Wall) we can go HQ first to hopefully make the corp too poor to rez their R&D ice. This also shows how important it is for the corp to be on at least 6 credit, as many early game ice cost 3 or less to rez, thus severely limiting our options here. Running R&D first similarly is a way to get the corp to spend money so he can’t rez his HQ ice. Doing so as the corp is a clear mistake unless a card like Indexing, Maker’s Eye or Dirty Laundry comes out to attack R&D first click, which then tends to be a big waste for the runner but can occasionally catch the corp off balance. If the corp does not have the money to rez both, or at least rez them in this order (in the case of Caduceus or Shadow) you are going to see a card for free and FAO also becomes a good follow up. Generally it is better to FAO the R&D ice right after the run on R&D rather than wait until after the HQ run due to Caduceus and Shadow as well as the threat of Indexing and Maker’s Eye being much larger on click 3 than click 4. This means that if the corp didn’t rez even though he could have afforded to he is more likely to want to rez rather than trash. A note that is likely less relevant to tournaments, but if you regularly play the same opponent it is important to vary up which server you hit first just to keep them guessing as letting them establish a pattern will allow them to read way too much into your first turn and have a much easier time optimally placing their turn 1 ice. On to the actual run then, before we run we should always consider the worst case scenario and our response to it. In this case, the worst ice that we can encounter is Caduceus followed by Shadow followed by Enigma followed by Ice Wall. We are fine with the Corp spending money on Enigma however, as we should be running a Yog to make them completely useless later on anyway. Shadow is annoying but doesn’t give us any choice, so we just have to take that on the chin. This early on, especially in an elimination round, we also don’t really have a choice about whether we’d like to keep the tag or not. Ice Wall is annoying because the Corp keeps a wide range of options, but it is later on going to become trivial to get through similar to Enigma, so we’re ok with this being on an important central rather than cheaply blocking Inside Jobs on a remote. Caduceus then is the most interesting case. It and other tracers are the primary reason you should virtually always play Sure Gamble before running, as these ice are going to cost you some money, thus dropping you down from five. Especially this early on, even against Weyland, I strongly feel it is generally preferable to make them actually pay for the Caduceus and not give them the first trace for free, unless you have a very good reason to save your money in your hand. This means the corp has an interesting decision against all runners without link who did not grab extra money first: he can pump the first trace by 1, thus pretty much ensuring he he will succeed at that trace (paying 4 to stop the corp from gaining 3 and also thus ensuring you can’t break the 2nd trace is a really bad deal) or he can keep it at 3 and either get the money for free or deal an economic blow to the runner. Generally the latter is preferable, but if you really need some money always be aware of the 1st option. Not beating this trace means the purpose of running R&D first, ie. getting the corp down economically to perhaps get into HQ, is wasted. While there’s a good chance the ice on HQ costs 3 or less, given that we are dealing with a Caduceus the corp can expect to gain money from, we can’t be sure. So unless the runner has a clear reason to keep that money, letting this trace go can really come to bite him later. The second trace is much more straightforward, you should virtually always be willing to pay 2 credits to see a random card, and in this case the runner is. The runner then runs on HQ and finds an Enigma, followed by taking a credit. He now has 4 credits to the Corp’s 3, with no cards on the board for the runner but 2 rezzed solid early game ice for the corp. Had the runner paid for the Caduceus, instead the corp would be dead broke and the runner would have a credit. Next turn would likely see the corp gain 3 credits and the runner could respond by gaining 4 or drawing a card, playing a card and gaining 2. Either way, the economic control would be on the runners side, even if the board position would still be corp favored for now. 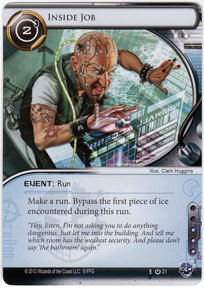 Of course, 4 credits is exactly what the runner needs to Sneakdoor next turn, which is the biggest threat he is telegraphing, although credit into Yog install into HQ run is also distinctly possible. While the corp can’t deal with both threats, icing Archives and taking 2 credits is a strong play for him. Let’s also talk briefly about ice placement. The downside of Enigma is that once the Yog comes out it is useless. The upside is that it forces the kind of expensive Yog. The upside of Caduceus is that it’s going to remain expensive to break for its cost the duration of the game, although the runner can force his way through. Additionally, if it is on HQ and the runner pays the 2 like he should he gains them back, thus coming out ahead economically versus the Caduceus being on R&D. Lastly, Caduceus allows us to potentially dump credits versus an Account Siphon if a trace is allowed to go off. There’s a case to be made for placing the Caduceus and Enigma as the corp has done in this case or switching their places. In general I would say that Caduceus on HQ and Enigma on R&D is a better long term play, while Caduceus on R&D and Enigma on HQ is a better way to get the runner behind economically right out of the gate. It stands to reason that the contents of your hand and deck should inform your decision as to which is preferable in any given game. Green Level Clearance into ice on a remote and archives. The ice on the remote is a mistake, as it opens the corp up to Bank Job and gives the runner a good FAO target. He could FAO, gain a credit, Sneakdoor and run archives if the corp rezzes the remote ice and be firmly in control economically for the next 2 turns at least while also gaining a lot of information well in advance of when he needs to respond to it (namely, what breaker he needs to get into the remote). Alternatively, the remote ice dies and was a waste, the only thing it did protecting the archives ice from that FAO. Given the clear threat of Sneakdoor however, the corp ought to be able to rez the archives ice. Against Gabriel we would rather keep our ice in our hand until we need it because it allows us to a) dilute our hand b) respond to his early aggression tricks and c) build a solid remote in a single turn. Ideally we play a 2 ice remote and put a card in it all in the same turn, or if we try to score (or bluff) a 3 pointer while keeping it on the table as shortly as possible we play a 2 ice remote on 1 turn and install and double advance another. Playing the 3 pointer at the same time as the ice and then advancing it three times the next turn is also a viable play however, especially due to Posted Bounty and Junebug. Also, note that even though Weyland had a transaction operation and thus would not have been economically behind as I talked about last turn, he would still have been less efficient had he been dead broke, as he’d need to take a credit to be able to play the GLC, which then also would’ve made him draw on click 2 instead of click 1, which could be scary for him to the point of keeping the GLC for next turn. Ironically in this case it probably would have just kept him from the ice on the remote play and done him a favor overall. The corp has 6 credits in the bank. The runner takes 4 credits, putting him on 8 credits. This is a big tempo hit for Gabriel, but one of the weaknesses this ID can run into against a strong corp start due to so much of his economy being contigent on successful runs. On the bright side, 8 credits is enough to threaten a lot of avenues of attack next turn and thus the corp can’t feel very safe. Depending on his deck composition, especially his economy, it may have been better to draw a card. This also goes if his hand is only so-so, and given the situation he is in, it seems likely that one of those 6 cards is weak enough to be ok discarding. From the corp’s perspective though, the fact that the runner has not tried to gain a better hand should be scary, as it signals a strong runner hand and he has no clue yet what kind of Gabriel exactly he is up against. Draw into a second ice on HQ into taking a credit, leaving him at 6. Clearly he feared the Yog, potentially into Account Siphon, swinging this game away from him. A reasonable concern. The question for the runner now is what that ice on HQ is. It’s safe to say it’s not another Enigma or other Code Gate, and given the amount of ice the corp had access to, an Ice Wall also seems unlikely. Archer and Hadrian’s would also be very questionable due to not being able to afford them. Caduceus and Shadow would both be good at maintaining the corps leading position, though ultimately not threatening. Worst case for the runner would be a Rototurret. Normally we expect to see the Roto on archives early on to trade out with the Sneakdoor and see the corp come out slightly ahead in board position but slightly behind in economy. Additionally, that Roto on archives gets much stronger if the runner installs a non-Sentry breaker program and even works fine against Faerie, although it becomes weak if a Ninja or Femme comes out. If the runner has a Sneakdoor he really needs to check the archives ice first, as if it is a Roto or Enigma it both works out alright for him. If he does not have a Sneakdoor however and he installs something else he is going to be locked out of archives until he gains a sentry breaker and additionally if he installs a Yog the worst thing the ice on HQ could be becomes a Rototurret. Unless we are desperate we should generally play safe by assuming the worst case scenario is true, especially when playing runner and especially when in an elimination round. The runner Special Orders a Yog, installs, draws a card and installs a Faerie. This is a very questionable turn. We’ll assume he already had the Faerie in hand as otherwise tutoring and installing the Yog becomes an incredibly poor play. However, were he to Special Order followed by installing the Yog and Faerie followed by the HQ run he is clearly gearing up for he’d be running on his last click and risking a Snare into Scorched or even Neural EMP flatline, as well as a SEA Source into single Scorched flatline. So, given that he isn’t going to make that run this turn and that he already has all the information to know this, the runner makes two rather elementary mistakes this turn. Firstly, if you are going to draw, always do it as early in your turn as possible. There’s no reason he couldn’t have drawn click 1 this turn. Had he drawn the Yog or a good economy card he’d have seriously improved his position. Secondly, try to keep your rig hidden until you need it, especially if its an investment to play it. So, while playing just the Faerie after a draw or two would have been fine, the tutoring for and installing the Yog really should have waited a turn. It’s obvious that the HQ run is coming, though it’s likely to be just a regular run and nothing too scary like a Siphon. We’re not really in a position to dump agendas from hand other than Hostile Takeover, so it’s best to just take the run coming at us, especially if we have a sentry on HQ. Even if we have a Hostile Takeover it might be preferable to keep it in hand to help mask a bigger agenda, although scoring it does turn on our Archer, and threatening that on our HQ will further slow down the runner. We should build up so that once the runner has made his play we can punish him next turn. The corp scores a Hostile Takeover, somewhat implying there are no bigger agendas in his hand while also going to 11 credits, enough to either cover up a weakness or go for a remote play next turn. Archers are now turned on and the runner has gained an early BP, which can become critical if the game goes on long enough, especially with Gabriel’s ability. In either case, the corps early game has seen him draw very good cards, especially given Gabriel’s ability and general deck archetypes. He got the ice and economy he needed and is in a stable position. The runner decided to maintain threats and build up new one by taking 4 credits, rather than actually committing to the HQ and making himself vulnerable to having the corp punish him hard using that remote next turn. A wise play that puts him on 6 credits. However note how little the runner has drawn all game while appearing rather limited in his options to put pressure. Not committing to the Yog just yet surely would have let him draw more cards, but also in this turn he has a clear opportunity to get a card or two drawn and increase his options. The corp draws into installing a 2nd ice on the remote and installing something in the remote, leaving him on 10 credits. He’s making that play he was gearing up for, though without the runner wasting his credits and breakers on HQ first. The corp must expect an Inside Job here, especially given the runners commitment to the quality of his hand by drawing so little. Inside Job. The corp rezzes a Caduceus which gets bypassed into an Archer, which gets encountered and broken with Faerie for 4, forgetting the BP and leaving the runner broke. The corp is left with 3 credits and reveals a Priority Requisition, which makes his previous turn a rather large mistake. Inside Job really was to be expected, and anything but a 3 pointer into that remote would have been preferable by far. The runner continues by taking a card and 3 credits, leaving him at 3 credits and 4 cards in hand. The runner seems committed to only drawing to deal with the threat of a single Scorched, although again in this case drawing up to 5 would have been a totally viable and potentially preferable option. Let’s also quickly discuss the corps agenda choices here. 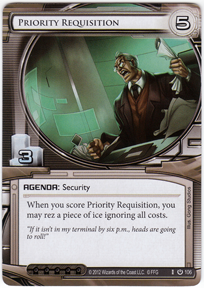 Hostile Takeover is pretty standard, while Priority Requisition implies big ice. This could just be the in faction Hadrians and Archer, but it could also mean Tollbooth and/or Janus and Oversight AI. Something interesting happens. Even though the corp just made a rather large mistake costing him 3 points, the board state is now such that the corp has safe centrals and an extremely safe remote. The situation is excellent for him to start aggressively pushing agendas through, ideally 3 pointers, another reason why any card but a 3 pointer would have been far preferable in that remote last turn. However, given Weyland’s propensity for operation economy and lack of good native upgrades, Weyland often struggles for things to put into the remote that isn’t an agenda. Melange, Ash, Jackson, Troubleshooter, Sansan, Bernice and various Ambushes are most likely, though any given deck is likely to run no more than 6 or 7 of these cards at most, and might have as little as 2 or even 0. Thus putting that 3 pointer in the remote and losing it may have been virtually unavoidable. Still, it would have almost certainly have been preferable to get another piece of ice on the outside of that server and be safe first, it may have even let us use that Priority Requisition on that Archer. The exception here is if the corp was getting clogged on big agendas, in which case he’s now in a pretty good position to score the rest of them. The corp draws for his first click, then takes 2 credits, going to 5 credits and discards a card, most likely another Enigma. The draw implies the corp recognizes that he can now score, and is searching for agendas, meaning he did not have another in hand. This makes his playing the Priority Req into the remote when the runner could Inside Job it a clear mistake. He could instead have drawn for another ice and gained some money to afford it and been much safer. Forged Activation Orders on the HQ ice. The purpose here is twofold, firstly we keep the corp poor and unable to use his strong board position to score agendas for a few more turns, giving us time to build up our own position. Secondly we get to find out which breaker we need to get into HQ and turn our ID, Shutdowns and Account Siphons on and get back in control of this game. Unfortunately for us, it’s a Sentry, which is going to be much more expensive for us to get through than a small Barrier. Additionally, if all we are running is Faerie and Femme it’s going to take us forever to get a sustainable way through that Rototurret. On the bright side, at least that Archer gives us a really good target for the Femme and once she is out, every single server becomes vulnerable. Rototurret on HQ back when it was played was quite an inspired play by the corp, and brings a bunch of implications to the table right now. Firstly, it means the corp has Rotos, and is unlikely to have just the one, so that ice on archives can still well be a Roto. This means that even if that ice is actually an Enigma, the worst case for the corp, his archives is still pretty safe from Sneakdoor. Secondly, Roto implies Corporate Troubleshooter, because between Roto, Archer and Grim the corp has plenty of targets to use the Troubleshooter and his money from his operation, ice and agenda economy to bully the runner into letting him score agendas at the threat of losing programs. Imagine how bad the runners position would be right now had that Priority Requisition been a Troubleshooter that bumped the Archer to strength 8 instead. This is a viable Weyland archetype, although recently a little less so due to Shapers strong program recursion. Either way, the runner should be acutely aware of the possibility of Troubleshooter now that he has seen a Roto. Lastly, once we assume Troubleshooter we can completely discount Ash, as they do very similar things and running both gains you no value. The runner proceeds to draw 2 cards and take a credit. Leaving him with 5 cards and 2 credits. Although FAO gave him some new information, unless the corp trashed the ice the runner would have been in no real position to respond. Thus, it may have been better to draw 1 card before playing the FAO on the general principle that drawing is always better earlier in the turn. However, it’s also unlikely that the runner had drawn anything that would have altered his turn, thus making this just a very small mistake. The corp takes 3 credits and dumps another card. It’s basically sure that none of the dumped cards are agendas, and either Enigmas, ambushes or large ice he doesn’t really need right now and in any case can’t rez for a good while are the most likely discards here. The corp is left with 4 credits and as such still can’t go for another 3 pointer next turn. 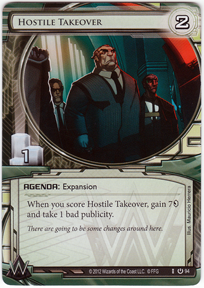 The runner takes 3 credits and plays a Sure Gamble, leaving him at 9 and 4 cards and getting into position to contest the next agenda the corp attempts to score. If he has a Femme or Special Order in hand he’s also only 2 turns away from safely running HQ while breaking even and using Siphon and Shutdown to get firmly in control of this game. Note how while the early game ice started out as the ideal defense for the corp’s centrals, in the midgame they are liable to become very cheaply broken and thus very weak against Criminals in general but Gabriel in particular. A big mistake intermediate players make is seeing how effective their central defenses are early on, getting lulled into a false sense of security and then being subjected to a massive swing in the game as the criminal runner unloads his Account Siphons, Shutdowns and Dirty Laundries in rapid succession. If able, placing a small barrier on HQ and uninstalling the Enigma is the cheapest way to maintain the current board position a while longer due to forcing the runner to acquire more gear before being able to use all his nastiest tricks. Alternatively, the corp can invest more into the future by geting a big, expensive to break piece of ice on HQ, though this likely will come at the cost of not being able to use that remote to score agendas for 3 or more turns, potentially wasting the biggest advantage the current board state provides. 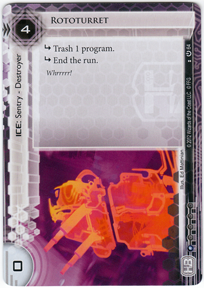 The corp draws, takes a credit, installs an ice over the ice on archives and discards a card. This implies the corp feared a Sneakdoor, which is a little odd given the threat of Rototurret requiring the runner to install both a Sentry breaker and a Sneakdoor. 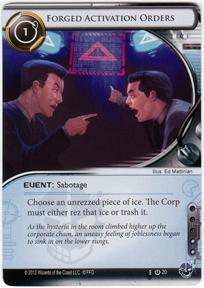 It implies the ice on archives was an Enigma, and further implies the corp has an agenda in hand, further evidence for this was the long hesitation before deciding which card to discard. Even with all that, it seems more optimal to either shore up HQ defense or start using the remote. However, the corps continued aggressive drawing speaks against him having multiple agendas in hand and for him trying to grab more economy. The corp is left with 5 credits, and thus can finally score another 3 pointer. The runner pays 3 to play a Quality Time, finally getting a ways into his deck. While Quality Time is influence efficient, the credit cost is a real hindrance here and this massive card draw burst feels like a crutch given the runners earlier passing up of opportunities to draw cards, electing to take credits for clicks, generally a poor runner play, instead. Running Quality Time and multiple Special Orders combined with the difficulty we’ve seen the runner have in setting up a rig suggests the runner is running only 1 of each of his major breakers and it is hurting him so far in this game. That said, if he hits some economy with this draw he can take control of this game. The runner next Inside Jobs into HQ. Using Inside Job on a central is generally a very poor play, but given that he wil gain the 2 credits back and likely would have otherwise discarded the Inside Job anyway, all he really does is trade a click for a random access of a card that it seems ok to conclude is about 20% likely to be an agenda, and if it is an agenda almost certainly a 3 pointer. All things considered this play is ok, but in general it points to some weaknesses in his deck as a result of either a lack of non-running based economy, only running 1 of each major breaker and relying on Quality Time as a pseudo-tutor and card draw burst rather than a steady trickle of card draw over the turns. 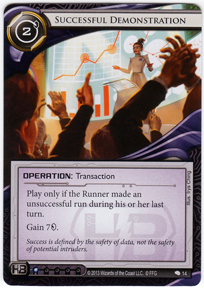 The runner sees Successful Demonstration, which ought to make the corp more likely to discard that card if he faces a difficult choice in the future again, as it is much less likely to land now. The runner next installs a Corroder, likely forced to once again tip his hand, this time due to card flood. He then installs an Armitage, finally getting some decent economy. He is left with 3 credits right as the corp is finally ready to begin scoring. All in all, a poor turn, but if the corp doesn’t make a move soon, the runner can use that Armitage to get into a commanding position and potentially win 7-0 or 7-1. The corp again draws with his first click, feeling either safe to do so or desperate for either an agenda to score or economy cards. If he has been digging for economy cards the past 4 turns, he would at this point have been much better served just taking credits instead. If we give him the benefit of the doubt and assume he was digging for agendas, the Inside Job becomes a poorer play, as the runner could instead have taken 2 credits from that Armitage. The corp next decides to install a card and take a credit, leaving him with 6. He’s threatening either an Atlas or a Melange here, although the card can also be a Troubleshooter or a Posted Bounty. If the latter, his next turn he will want to play Hedge Fund or Beanstalk followed by double advancing it to threaten a kill the turn after. The runner would do well to gear up to take down the remote next turn, preferably while being able to Infiltrate first. If not able, he is safely able to let any agenda go through given the gamestate, although an Atlas with counters could be bad, and a Posted Bounty requires an answer within the next 8 clicks. The runner takes 4 credits for Armitage and runs archives, a huge and unnecessary risk. A roto sniping either breaker right now would be a disaster. The corp does not rez thus implying the ice on archives is a Wall of Static, Bastion or Ice Wall, in roughly that order of likelihood. There’s also a chance it is something big, including an Archer, which he can’t afford to rez, but which he played already because he was clogging on cards and would rather play them now and see them become maybe useful later than discarding them, taking the risk of another Forged Activation Orders. The runner predictably does not see an agenda in archives and uses his last click to take 2 more credits. Given that this was going to be the runner’s turn, he would have been better off running on click 1, as he had enough credits with the BP to break any Barrier the corp could afford to rez. Had he then run into a Roto, he would have had more clicks to take the best actions to begin to come back from that. A very small mistake, as a Roto would have probably been fatal in either case. The runner is left with 9 credits. Another ice on the remote followed by an Oversight rezzing it and revealing it to be another Archer. The remote is now even more secure, although it must be noted that the corp’s position can look significantly stronger than it is. If the runner installs a Femme targetting the inside Archer and a Faerie, he can get into the remote for 12 (plus 9 install costs) while trashing the outer archer and making the remote vulnerable to repeat runs for just 8 credits a pop, which while still a lot is a bargain considering the resources invested into it. Additionally, that Femme would open up HQ and R&D, requiring a lot of attention and resources from the Corp while letting the runner gain a big economy from Account Siphon and Dirty Laundry runs. To make matters worse Emergency Shutdown can further punish the corp, either destroying the remote further, or making the corp sink significantly more resources into shoring up the now weak HQ and R&D. Alternatively, a Femme into Account Siphon would only cost 11, and the resulting 10 credits the runner would be left with could go towards further Siphons and the wrecking of the remote. In sum, investing this heavily into the remote while leaving the centrals so lightly defended is a major liability, even if the corp is virtually guaranteed to be able to score any 1 single agenda he wants at this point. For his last click the corp gains a credit, leaving him with 4. Given that he didn’t go for the card in the remote this turn, it is very likely not an Atlas, it is probably not a Posted Bounty, meaning it is either a 3 pointer or not an agenda at all. If it is a 3 pointer he can’t score it for at least 2 more turns. If it is not an agenda it is virtually guaranteed not a Melange or any other kind of economy card. An Ambush card also seems very unlikely. Most likely it is another 3-pointer. 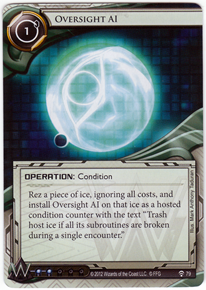 Given that we have seen Oversight AI we can assume multiple big ice in the deck, either Hadrians or Tollbooth or both are likely. Furthermore if the agenda is another Priority Requisition it doesn’t have any great targets right now, which would delay the corp another turn if he wants to get the most out of it. If the agenda is Government Contracts that makes it likely that the corp’s agenda composition is 3x Contracts, 3x Priority Req and then either 2x or 3x, with 3x being more likely, Hostile Takeover. The deck archetype then is big money to make a single big remote with big ice to use to score big agendas that further fuel more big ice. This is supported by a bunch of small ice to delay the runner as much as possible and potentially Troubleshooter to use the economy to seal the deal. If we assume 3x GLC and 3x Successful Demonstration and 2x Rototurret, we know 10 influence, leaving 5 for Tollbooth, Jackson, Corporate Troubleshooter or SEA Source, with SEA being least likely. Given that we’ve seen no tagging ice, this deck may well not run any Scorched at all. The runner plays another Quality Time, showing his 5th influence. Given that we suspect only 1 of each breaker, it is still really hard to say what the other 10 influence might be. We see the runner has a Sneakdoor in hand, and given that he already ran archives and didn’t lose a breaker, it seems like a good idea for him to force the corp to rez that ice, and hopefully start getting into HQ at a profit. The BP makes this likely. Instead, the runner Special Orders up a Faerie, which is generally poor unless you already have all the permanent breakers ready. This signals the Femme or Ninja is already in his hand. The runner then installs this Faerie and FAOs the ice on archives. It would have been far superior to FAO before tutoring up the Faerie, in my view, as now that archives is open the runner could Sneakdoor into running this turn, risking a very unlikely Snare given what we know of the influence the corp has spent. If the corp does not respond, we get a sustainable economy that, combined with Armitage and potentially Desperado, can get us our Femme online pretty quickly, which will then allow us to begin locking this game down. We will likely have to give up the agenda currently in the remote, but given the general board position and the fact that it may not even be an agenda at all, this is a more than fair trade. The runner ends his turn with 4 credits after discarding a Dirty Laundry and a Crypsis. Crypsis further telegraphs that the runner has the Ninja, Femme or third Special Order hand, while discarding the Dirty Laundry suggest the runner has plenty of other economy in hand. The corp takes a credit and advances the remote twice, leaving him 3 credits.. A clear play for a 3 pointer. Posted Bounty is extremely unlikely as the corp would only be able to afford 1 Scorched, but to be safe the runner shouldn’t dip below 4 cards this turn. This agenda does not seems scorable for the runner, and given that Priority Requisition would not have a target, the worst it could be would be a Government Contracts giving the corp a sustained economy or an Atlas with 2 counters giving the corp a lot of flexibility. We can afford to let the corp score either in exchange for bankrupting himself and finally getting ourselves in the drivers seat this game. We should ignore the remote (except for ensuring we end our turn with 4 cards) and build towards getting our Femme out and putting pressure on the Corp. We should Sneakdoor and take money. The runner runs HQ, using the Faerie to get past the Roto, gaining 2 credits and seeing a card. It is a Tollbooth which should tell us where another 4 influence points are and firmly convince us that this deck runs big ice, big money, likely big agendas, no Snares, no fast advance, no other Ambushes and likely no Troubleshooters, Ashes or Bernice’s. In fact, this deck may well not even run Melange making every single card it plays into a remote an agenda. Scorched Earth also becomes less likely, though we cannot discount Posted Bounty and Shadow entirely yet. The runner then Shutdowns both Archers, which just goes to show how fragile the corp’s position actually was, even if it did look so good. The runner then runs the remote with 6 credits in the bank to the corp’s 3. This means the runner is exactly 1 credit short of being able to get into the remote (BP). To make matters worse, the runner pays 3 for the first trace when he encounteres the Caduceus, not only not using the Bad Publicity but making a strictly inferior play to not paying for the trace. Consider if he had not paid for the trace. The corp would have gained 3 credits. The corp has an agenda in the remote and wants to keep the runner out, the corp would have to pay those 3 credits he just gained plus another credit to achieve this. If instead we payed the 3 credits for the first trace, he pays just the 1 credit. Thus the end result is exactly the same for the corp, but if we do not pay for the first trace we keep 3 credits more in our bank. The corp does not have an agenda in the remote. This is very unlikely for reasons we already discussed, but the most likely card in that remote in this case would be a Junebug, which is going to kill us in either case, thus this choice not mattering. The corp has an agenda in the remote but does not want to keep us out, either because he is making a major mistake or because he realizes that if we are not breaking the first subroutine he can not score and also can not keep us out next turn if we simply grab some money and run again. In this case we get the agenda paying only 2 for the 2nd subroutine in exchange for giving the corp 3. Not ideal, but a fair trade for an agenda and wrecking the corps remote, probably permanently. The corp gladly pays 1 credit to keep the runner out on the second trace, and the runner is left with only 3 credits and 3 cards in hand. Note however that if we gain 6 credits next turn from our Armitage and then run we will have 9 credits. If the corp takes 3 credits he will have 5. If we remember the BP this time it means we can gain access to the remote in this case next turn. All in all a very poor turn for the runner even if we wrecked those Archers. We can now only hope we do not see a Beanstalk or Green Level Clearance next turn and that the corp discarded that Successful Demonstration we saw a little while earlier. Beanstalk into Successful Demonstration into replacing the Oversighted Archer, with what may well be that Tollbooth we saw. The disaster is complete. The corp is left with 10 credits. The runner draws twice, illegally reorders his heap (at least it doesn’t matter yet, but pay attention people! ), FAO’s the inner Archer, causing it to be discarded and draws another card. Once again we have an order of play mistake here, as there is no downside to drawing first and playing the FAO after. No Sneakdoor also feels like a mistake. The heavy drawing implies the runner does not in fact have a Ninja or Femme in hand, making the entire last 3 turns mistake after mistake. The corp scores a Government Contracts, giving him a sustained economy and making it all but certain his agenda composition is 3x Priority Req, 3x Contracts and 2-3x Hostile Takeover, with 3x being more likely. Posted Bounty is almost guaranteed not in this deck and Shadow has become very unlikely. In turn, this makes it more likely than not that Scorched Earth is not in this deck at all. 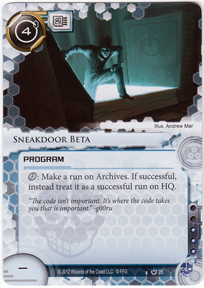 Runner takes 2 credits from Armitage, finally installs Sneakdoor and runs archives with it, seeing another Rototurret, then draws a card. Given that Snare and Scorched are now incredibly unlikely and that we are getting desperate anyway,it would have been better to draw first click and then take money, install and run. Runner is left with 2 credits. Corp takes 4 from Contracts and installs what is likely the Roto we just saw on Archives. That Roto really was the worst possible thing the corp could do to respond to our Sneakdoor. Corp is left with 11 credits. Runner draws, takes 2 off of Armitage and installs a Plascrete, then takes his last 2 off of Armitage to be left with 3 credits. Given the gamestate even if the corp was likely to run Scorched we’d probably be better off deferring the installation of that Plascrete. Given the likelihood of Scorched and the virtually guaranteed absence of tag-delivery mechanisms however, we should not install that Plascrete at all and instead fully focus on getting our Femme or Ninja that we’ve already needed for 10 turns up. 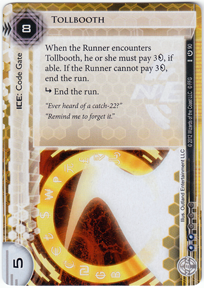 While the likely Tollbooth on the remote is vulnerable to the last Inside Job in the runner’s deck (provided he even has 3, as a recent-ish trend is to run only 2, although that’s more of an Andromeda than a Gabriel play), the Caduceus is going to remain good as long as the corp stays ahead economically, which is entirely doable given the Contracts, especially with the runner wasting money on Plascrete. This means our remote is solid and we should try to get another 3 pointer scored as soon as possible. Doing first click draw into Contracts to try to draw one if we don’t have it yet is good until we get to about 20 credits, at which point we should just start drawing. If we get an Ice Wall or similar we can put it in front of the Tollbooth and be safe so long as we have 9 credits, as the runner has no way through. 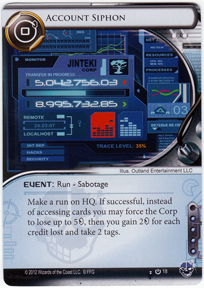 The corp installs a card and takes 4 credits from Contracts. A solid play, for had the corp double advanced he’d be left with 8 credits. If the runner had then taken 3 credits and played Inside Job, he’d be able to get in due to the BP. The corp could have kept the agenda in hand, but clearly feels more comfortable having it in the remote. This is a little questionable, because if the runner gets his third Faerie and the inside Job he can snipe it out of the remote. Similarly, if the runner draws and plays a couple of money cards over the next 6 clicks (let’s say draw and play two Sure Gambles and 2 clicks to take credits to get to 5, putting him at 13) he could play Femme on the facedown and get in with the last 2 clicks of next turn and grab the agenda. Alternatively take 6 credits, install Femme and Stimhack. These are all quite unlikely possibilities but they still seem more likely than the runner pulling off an economic miracle and additionally getting lucky sniping the agenda out of hand. Given that the corp is firmly ahead, minimizing the amount of Hail Mary plays you are exposed to becomes the name of the game. Unless the runner has a way into the remote in hand within the next 8 clicks, he needs to start by drawing. The runner draws then plays Armitage, if he has Femme and Stimhack he can get in after taking credits to afford to Femme Install over the next 4 clicks. He takes 4 credits over the next 2 clicks, leaving him at 6. The corp should be a little nervous about having played that agenda down, but if a Stimhack is coming, no additional piece of ice he can play besides his third Archer or another Tollbooth would save him, and that Archer would be very, very expensive in terms of Agenda points. On the other hand, it’d likely wreck the runner’s breakers and end the game that way, unless the runner has another Crypsis somewhere in his deck. The corp installs another ice on the remote and advances twice. Unless the unknown ice that was already on the remote was not Tollbooth or this new ice is either also a Tollbooth or an Archer this will do nothing versus Femme into Stimhack as the runner will still be able to get in. If the ice is Ice Wall into Tollbooth the Corp is much safer versus Inside Job now, however. The corp is left with 10 credits. The runner draws, meaning Femme into Stimhack is off the table. If the runner gets Inside Job he should still use it to force the corp to rez a bunch and delay his scoring. It risks running into Archer and losing, but the runner is firmly behind here. Faerie plus Inside Job is probably his best case scenario here. Instead, he plays another Plascrete. This is entirely a mistake. Even if we had not previously discounted Posted Bounty and Scorched, the corp can only play 2 Scorched next turn if the card in the remote is Posted Bounty, meaning we’re fine as long as we hold 4 cards in hand. The runner then takes 4 more credits. Leaving him with 7. Unsurprisingly the corp scores a Priority Requisition, rezzing what we already suspected as a Tollbooth for free and being left with 7 credits. Draw followed by two times Armitage followed by Same Old Thing. If the corp has a Hostile Takeover it is all over. If we have any plays that let us access cards at all we should have taken them and hope for the best. The runner has 11 credits. We need to just score as fast as possible. Draw into 4 money until we are at 15 or so, then drawing until we get an agenda seems like the best course of action. The corp draws, plays Hedge fund and places another ice on HQ. This telegraphs that he has just picked up Hostile Takeover, or he is too scared to start drawing aggressively until his HQ is a little more secure. He is left with 11 credits. We must access whatever we can to get a better tiebreaker position. The runner draws four times, making playing Same Old Thing last turn rather than drawing then possibly a mistake. The runner discards 2 Sneakdoor, a Corroder and another Dirty Laundry. This is interesting because it means he is likely to have at least 2 Corroder and 2 Yog in his deck. 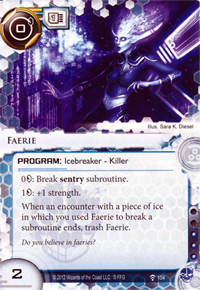 Combine with 3 Faeries, a Femme and a Crypsis and we have a likely breaker suite. This means that his reluctance to draw early on was a poor decision, as he had a decent chance to draw some breakers naturally rather than having to use so many Special Orders so early on. That then could have allowed him to use Special Order to get a full breaker suite online during the midgame, rather than never. We also saw another green card in his hand a while ago, so likely the runner spend 6 influence on 2 each of Yog and Corroder, up to 6 on R&D pressure, and 3 on Quality Time. The big question is if he has 2 Stimhack. 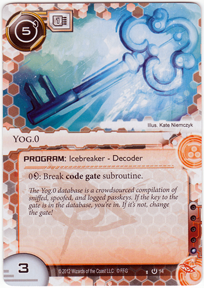 The corp can deduce the QT and the Yog and Corroder, leaving 6 influence for either Parasites and/or Datasuckers which we likely would have seen by now, Stimhack and/or R&D pressure. Note also how the Dirty Laundries were entirely dead cards this entire game. While they are great when Gabriel works, further amplifying his strengths, they are firmly in the “win more” camp with this deck-type because they do nothing for Gabriel if the corp gets a good start and can keep him out. Starving Gabriel can lead to a critical deck failure not unlike what we have seen this game. The corp continues to draw and take money and also places a card into the remote, leaving him at 15 credits. Once again the corp believes his remote is safer than his hand for what is likely an agenda. Once again though, if Gabriel is running 2x Maker’s Eye for R&D pressure in addition to 2x Stimhack, given that last turn he drew 4 times and can draw twice more this turn and given that he has 11 credits in the bank, he could either draw twice more into Femme, Stimhack (although if the unknown ice is Tollbooth the corp is safe) or play Sure Gambles or Easy Marks into Femme, Inside Job (potentially using Same Old Thing for this). For example Sure Gamble, Install Femme, Use Same Old Thing to Inside Job would see the runner run with 4 credits and a BP, and thus able to get into the remote. The Runner plays R&D Interface and uses Same Old thing to Inside Job into R&D. He will have a click left, thus making drawing first better, as who knows what option it would have afforded him. That said, as far as Hail Mary’s go this isn’t terrible. Depending on how lucky he gets he can either win the game, or get on 6, 5 or 4 points for the tiebreaker. Especially if he gets on 6 points or wins, he has managed to salvage a lost position. He sees two cards, neither of which are agendas, then draws. Scores Hostile Takeover to win the game. A convincing corp victory made possible by the corp getting the right ice at the right time in the right order, the runner making some clear and serious mistakes and not getting the breakers and economy at the right time himself. The biggest turning point of the game was when the runner didn’t just let the Government Contracts go but insisted on contesting it, wasting too many resources to do so and ultimately still failing to get it. Had he instead used those resources to build up his board position he could have gained a commanding board position and ultimately a lock on the game. While the Corp likely would have scored at least 4 and possibly 5 points due to his strong start and solid play, the runner would likely have won. I’m speculating here, but it seems the runner panicked once the Oversight went down on the Archer due to the Corp’s board position looking so strong at first sight. What appears to be the audible reaction to this play by the runner also points in this direction. However, had he calmly sat back and assessed the board for a minute he might have realized that a single Femme or even Ninja could have blown the game wide open. Even Crypsis to let him Shutdown the Archers and still land Siphons after would have dramatically changed this game. The corp played light on central defenses from the midgame forward and never got truly punished for it, but was instead able to keep the runner’s attention on the remote, where the corp was strongest by far. Thanks Orange Devil for the super deep delve into specific game strategy. Analysis on game 2 is available here.